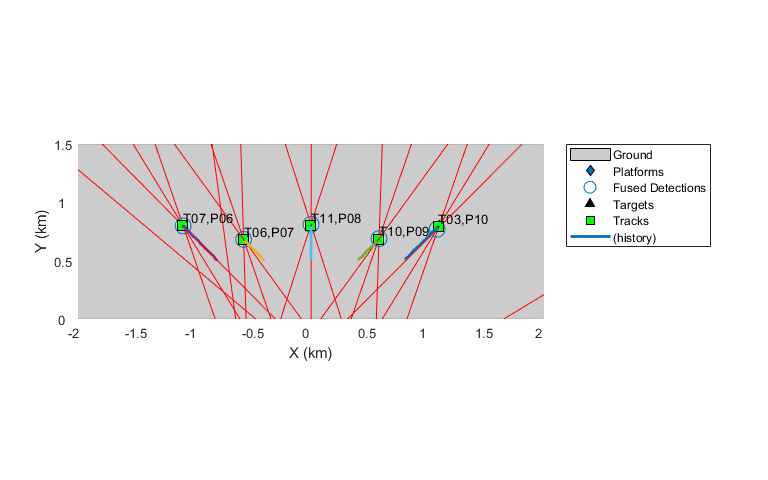 This example illustrates the tracking of objects using measurements from spatially-distributed and synchronous passive sensors. 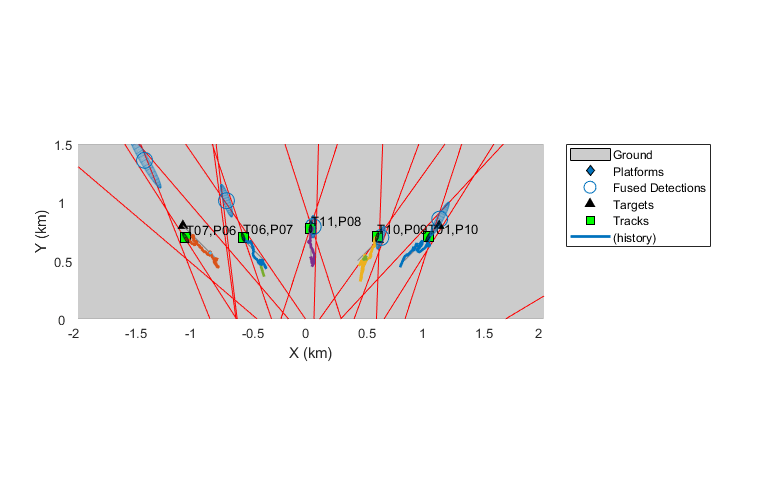 In the Passive Ranging Using a Single Maneuvering Sensor, you learned that passive measurements provide incomplete observability of a target's state and how a single sensor can be maneuvered to gain range information. Alternatively, multiple stationary sensors can also be used to gain observability. In this example, you will learn how to track multiple objects by fusing multiple detections from passive synchronous sensors. This example demonstrates the use of the Static Fusion Before Tracking  architecture for tracking using passive measurements. The Static Fusion part of the architecture aims to triangulate the most likely set of detections and output fused detections containing estimated positions of targets. As measurements need to be fused together by static fusion, the sensors must report measurements synchronously. Therefore, one must use 3 or more sensors to reduce the problem of ghosting. Due to the presence of measurement noise and false measurements, it is difficult to eliminate the problem of ghosting completely. Ghost triangulations returned by static association are likely to be discarded by the dynamic association blocks as the geometry of targets and sensors changes during the scenario. 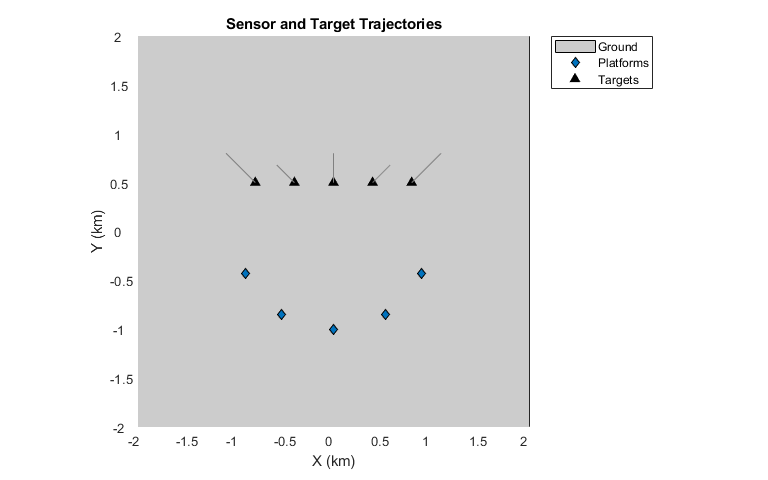 The relative placement of sensors and targets in the scenario used here is taken from an example in . The scenario consists of five equally-spaced targets observed by three to five passive sensors. The passive detections are modeled using radarEmitter and radarSensor with DetectionMode set to ESM. The HasNoise property of the sensors is set to false to generate noise-free detections along with false alarms. Noise to measurements is added in this example via a user-controlled variable. This is to simulate the effect of sensor noise on static fusion. Each sensor has a field of view of 180 degrees in azimuth and a FalseAlarmRate of 1e-3 per azimuth resolution cell. This results in 2 to 3 false alarms per scan. The scenario definition is wrapped inside a helper function helperGenerateFusionScenarioData. In this section, only measurements from the inner three sensors are considered and measurement noise covariance for each sensor is set to 0.01 degrees squared. The detections from each sensor are passed to a staticDetectionFuser. The MeasurementFusionFcn for passive triangulation is specified as triangulateLOS. The MeasurementFusionFcn allows specifying a function to fuse a given combination of detections (at most one detection from each sensor) and return the fused position and its error covariance. The parameters FalseAlarmRate, Volume and DetectionProbability are specified to reflect the parameters of sensors simulated in this scenario. These parameters are used to calculate the likelihood of feasible associations. The UseParallel property, when set to true, allows the fuser to evaluate the feasible associations using parallel processors. The tracking is performed by GNN data association by using a trackerGNN. The tracking performance is evaluated using trackAssignmentMetrics and trackErrorMetrics. % MeasurementFusionFcn and specify parameters of sensors. % Use assignment and error metrics to compute accuracy. dT = 1; % 1 Hz update rate of scenario. Results from tracking using three sensors with 0.01 degrees-squared of noise covariance can be summarized using the assignment metrics. Note that all tracks were assigned to the correct truths and no false tracks were confirmed by the tracker. These results indicates good static association accuracy. The error in estimated position and velocity of the targets can be summarized using the error metrics. The errors in position and velocity are within 7 meters and 2 meters/sec respectively for all targets and the normalized errors are close to 1. The error metrics indicate good dynamic association and tracking performance. The fusion of passive detections to eliminate ghosting is highly dependent on the accuracy of passive measurements. As measurement noise increases, the distinction between ghost associations and true associations becomes less prominent, resulting in a significant drop in the accuracy of static association. With closely spaced targets, incorrect association of fused detections to tracks may also occur. In the next section, a helper function helperRunStaticFusionSimulation is used to re-run the scenario with a measurement noise covariance of 2 degrees squared. Note that a large number of tracks were confirmed and then dropped in this simulation. 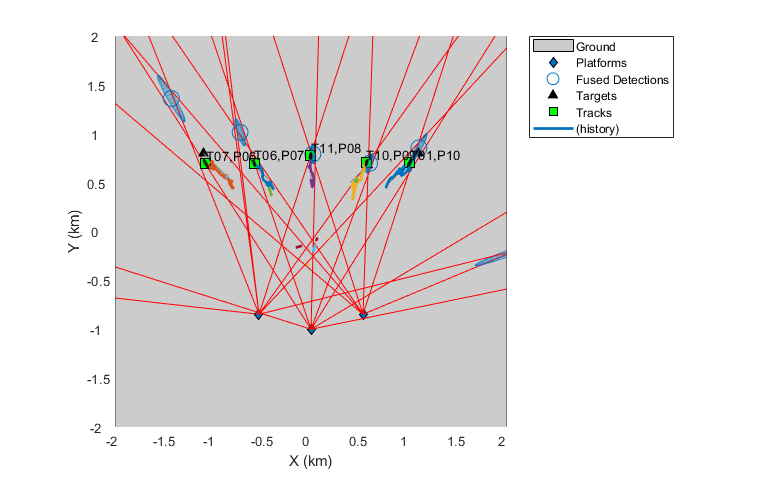 Poor static association accuracy leads to ghost target triangulations more often, which results in tracker deleting these tracks due to multiple misses. The estimated error for each truth is higher. Notice that the track jumps in the theater display above. The association accuracy can be improved by increasing the number of sensors. However, the computational requirements increase exponentially with the addition of each sensor. The static fusion algorithm spends most of the time computing the feasibility of each triangulation. This part of the algorithm is parallelized when the UseParallel property of the staticDetectionFuser is set to true, which provides a linear speed-up proportional to the number of processors. To further accelerate execution, you can also generate C/C++ code which will also run in parallel execution on multiple processors. You can learn the basics of code generation using MATLAB® Coder™ at Getting Started with MATLAB Coder. To accelerate MATLAB Code for simulation, the algorithm must be restructured as a MATLAB function, which can be compiled into a MEX file or a shared library. For this purpose, the static fusion algorithm is restructured into a function. To preserve the state of the fuser between multiple calls, it is defined as a persistent variable. MATLAB® Coder™ requires specifying the properties of all the input arguments. An easy way to do this is by defining the input properties by example at the command line using the -args option. For more information, see Define Input Properties by Example at the Command Line (MATLAB Coder). To allow variable number of detections, you will use the coder.typeof function to allocate data types and sizes for the inputs. % via example by using the |-args| option. In this section, detections from all five sensors are used for tracking and a measurement noise of 2 degrees squared is used. 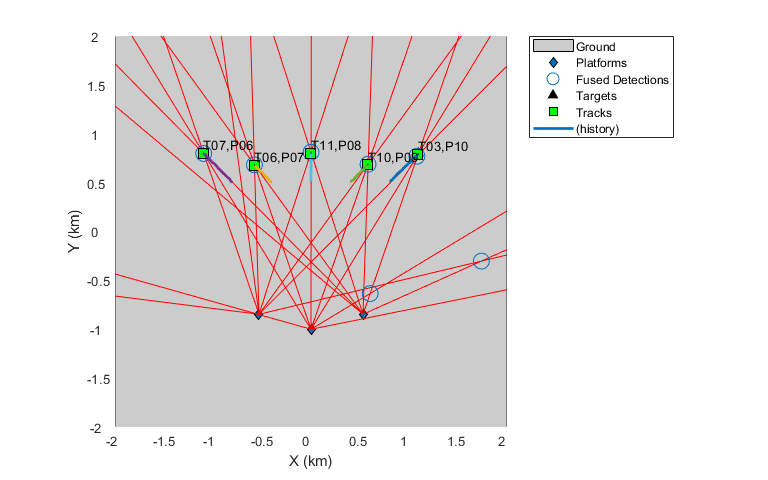 The assignment results from tracking using five sensors show that all truths were assigned a track during the entire simulation. There were also no track drops in the simulation as compared to 6 track drops in the low-accuracy three sensor simulation. The estimated errors for positions are much lower for each true target as compared to the three sensor simulation. Notice that the estimation results for position and velocity do degrade as compared to three sensors with high-accuracy measurements. 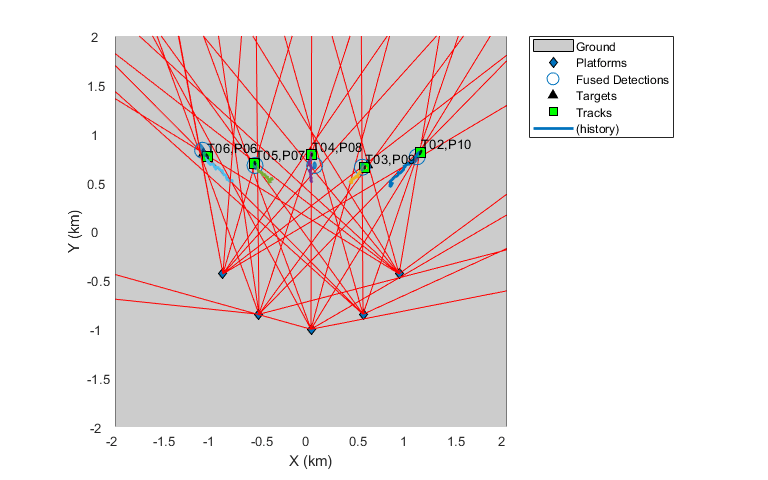 This example showed how to track objects using a network of distributed passive sensors. You learned how to use staticDetectionFuser to statically associate and fuse detections from multiple sensors. The example demonstrated how this architecture is depends parameters like number of sensors in the network and the accuracy of sensor measurements. The example also showed how to accelerate performance by utilizing parallel computing and automatically generating C code from MATLAB code. trueAssignment Use ObjectAttributes of track to assign it to the right truth. Bar-Shalom, Yaakov, Peter K. Willett, and Xin Tian. "Tracking and Data Fusion: A Handbook of Algorithms." (2011).